Magpies are not attracted to shiny objects and don't routinely steal small trinkets such as jewellery, according to a new study. In European culture, it is widely accepted that magpies (Pica pica) are the pilferers of the bird kingdom, unconditionally attracted to sparkly things and prone to pinching them for their nests, almost as a compulsion. But psychologists at the Centre for Research in Animal Behaviour (CRAB) at the University of Exeter are now countering this folklore, having shown that the species is actually frightened of new and unfamiliar objects, rather than attracted to them. The researchers carried out a series of experiments with both a group of magpies which had come from a rescue centre, and wild magpies in the grounds of the University. Under carefully monitored conditions, the birds were exposed to both shiny and non-shiny items, and their reactions recorded. Dr Toni Shephard, lead author of the study, said: "We did not find evidence of an unconditional attraction to shiny objects in magpies. Instead, all objects prompted responses indicating neophobia – fear of new things – in the birds. "We suggest that humans notice when magpies occasionally pick up shiny objects because they believe the birds find them attractive, while it goes unnoticed when magpies interact with less eye-catching items. It seems likely, therefore, that the folklore surrounding them is a result of cultural generalisation and anecdotes rather than evidence." 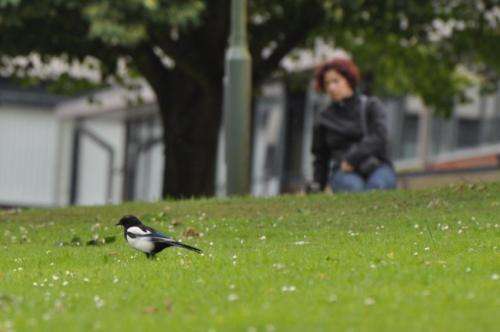 The field experiment was conducted at eight sites on the University of Exeter campus where magpies are accustomed to regular human activity, allowing observations to be conducted in close proximity. The test objects were shiny metal screws, small foil rings and a small rectangular piece of aluminium foil. Half of the screws and rings were painted blue with matt paint, and the rest left in their original shiny silver colour, as was the piece of aluminium foil. After control tests without objects had been carried out, two loose piles of food (nuts) were placed on the ground with two piles of objects (shiny and non-shiny), each placed 30cm from a nut pile. Magpies only made contact with a shiny object twice in 64 tests. Both times a silver ring was picked up and immediately discarded. The birds either ignored or avoided both shiny and blue objects, often exhibiting wary behaviour and feeding less in the presence of the items. During the study with captive birds, none of them made contact with any object, be it shiny or blue. Dr Natalie Hempel de Ibarra, co-author of the article, said: "Surprisingly little research has investigated the cognitive mechanisms of magpie behaviour. Similarly to other large-brained members of the crow family with complex social systems, magpies are capable of sophisticated mental feats, such as mirror self-recognition, retrieval of hidden objects and remembering where and when they have hoarded what food item. Here we demonstrate once more that they are smart – instead of being compulsively drawn towards shiny objects, magpies decide to keep a safe distance when these objects are novel and unexpected." More information: "'The thieving magpie'? No evidence for attraction to shiny objects" is published today in the journal Animal Cognition.